Only 38 km from Mendoza's capital in Argentina sits a natural water park wedged within the gorgeous Andes mountains. 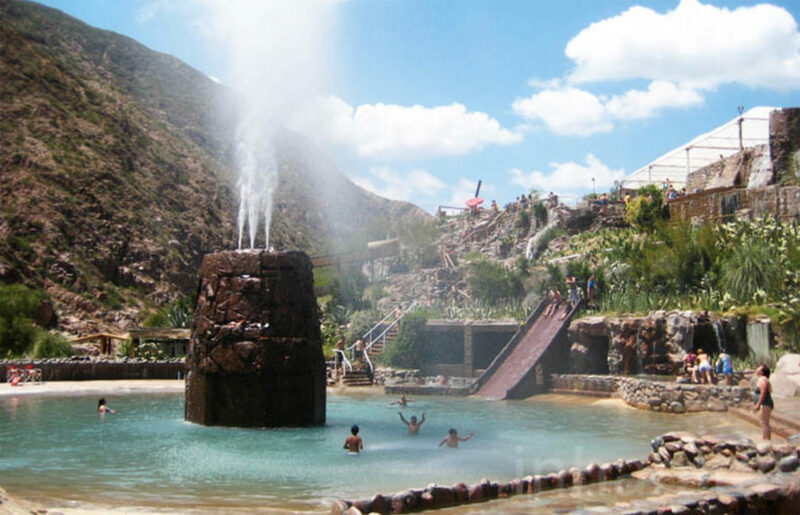 The Cacheuta Water Park (Termas de Cacheuta Parque de Agua) is a fantastic, year-round water escape for kids and adults, employing geothermal-heated mineral water sourced from just a few meters underground. 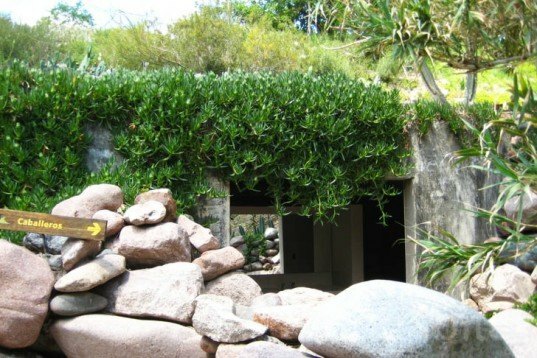 The spectacular park includes various outdoor pools and streams -- made using local stone -- a cascade restaurant, cave-style toilets, and picnic facilities for friends and family to enjoy a day between the mountains. Cacheuta Hot Springs is only a short bus ride away from Mendoza’s capital, and the entry cost is only $7(US) for adults. It is the perfect place to spend a day out with friends or family swimming, or just relaxing in one of the thermal pools or streams –some which even reach 39º C! It’s also a great place for kids to play, with slides, tunnels and an octogonal central pool featuring a stone water jet shooting thermal water 10 meters into the sky. Located next to the Mendoza River in a dry, mountainous area between the Andes, the Cacheuta Water Park is a mind and body-escape developed to extend from the natural environment. Visitors typically visit for the day, enjoying the park and dedicated picnic and BBQ areas. For those looking for more service, there is also a stone wall restaurant serving affordable food across Flintstones-style sets of tables that can accomodate large groups of people who want to enjoy eating al-fresco. The structure has been oriented in such a way as to maximize the magnificent views of the surrounding landscape. Not limited to water play, for the more sporty, there is also a climbing wall for practicing some moves before attempting to climb the nearby Aconcagua. With an array of activities rolled into one exciting destination, Cacheuta Water Park is a fun, healthy and relaxing option to spend a free day! 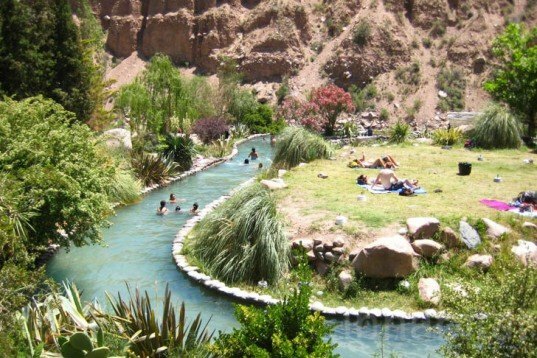 Cacheuta Hot Springs is only a short bus ride away from Mendoza's capital and the entry cost is only $7(US) for adults. It is the perfect place to spend a day out with friends or family swimming, or just relaxing in one of the thermal pools or streams --some which even reach 39º C! It's also a great place for kids, with slides, tunnels and an octogonal central pool featuring a stone water jet pumping thermal water 10 metres into the sky. Located next to the Mendoza River in a dry mountainous area between the Andes, Cacheuta Water Park is a mind and body-escape developed to extend from the natural environment. Visitors typically visit for the day, enjoying the park and dedicated picnic and BBQ areas. For those looking for more service, there is also a stoney wall restaurant serving affordable food. There are even Flintstones-style sets of tables that can accomodate large groups of people who want to enjoy eating al-fresco. The structure has been oriented to maximize the magnificent views of the landscape from within. Not limited to water play, for the more sporty, there is also a climbing wall for practicing some moves before attempting to climb the nearby Aconcagua. With an array of activities rolled into one exciting destination, Cacheuta Water Park is a fun, healthy and relaxing option to spend a free day!